Pinball is a popular coin-operated game frequently found in amusement arcades. Players shoot small balls through complicated paths and into targets on a playing field under glass. The balls are manipulated with swinging arms, called flippers, which are connected to the playing field. The games are brightly colored and lit, and appeal particularly to young people. Though pinball has ancient origins, its heyday in the United States was between the 1930s and 1970s. Pinball developed out of a marble game popular in France during the reign of Louis XIV. The French game was called Bagatelle, named after Castle Bagatelle, the palace of King Louis' younger brother Duke Arthur, an inveterate gambler and gamer. Bagatelle used a wooden game board with holes in it. Players pushed small balls along the board using a stick, which resembled a miniature pool cue. Players scored if their ball dropped into a hole, though the ball had to negotiate nails driven into the board as obstacles. Bagatelle was extremely popular in sophisticated circles in France by the 1780s. French soldiers brought the game to the United States during the colonies' war for independence, and it spread across America wherever military men were posted. In England, the game of Bagatelle is mentioned in Charles Dickens' the Pick Wick Papers of 1836, where characters play the game at a table installed in the back of a tavern. Full-size games were common across Europe and the United States by the 1830s, as entertainment in taverns, inns, and stagecoach stops. These games were about the size of a modern pool table. Due to its popularity, manufacturers also began to produce smaller table-top versions as toys for children around this time. By the 1880s, both adult and children's versions of Bagatelle games were found around the world. Different arrangements of playing fields were given names like Chinese Bagatelle and Russian Bagatelle, and other popular versions were called Cockamaroo and Tivoli. A major technological advancement altered the game with a patent granted in 1871 to Montague Redgrave, of Cincinnati, Ohio. Redgrave was the first to add a spring-loaded plunger to the game, so that the ball was shot onto the playfield mechanically. This early modification remained in use throughout the history of the game. 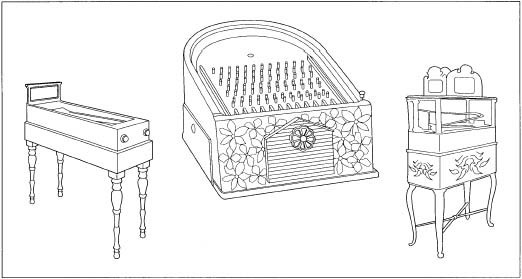 Another signal development came in 1889 when an Englishman, Henry Pessers, patented a coin-operated version of a Bagatelle game. His game was called Pickwick, and was different from most of its predecessors in that it was mounted vertically on a wall, instead of inclined on a table. Several American companies manufactured similar coin-operated pinball-type games early in the twentieth century. Some games offered prizes for skillful play, though the prize, often a free beer or cigar, had to be supplied by the owner of the establishment where the game was played, and was not given out automatically. Many innovators added features to these games, such as the glass panel protecting the playing field and automatic score counters. One of the most successful early pinball games was Baffle Ball, developed by David Gottlieb in 1931. Baffle Ball was a mechanical, coin-operated Bagatelle-type game. It cost only a penny to play, and the complete game sold for $17.50. It became immensely popular in the United States, and Gottlieb sold more than 50,000 games in its first year. Ray Moloney, one of Gottlieb's distributors, invented his own similar game, Ballyhoo, in 1932. This brightly colored game became even more popular than Baffle Ball. Moloney formed the Bally Manufacturing Company to manufacture his games, and sold 75,000 games in 1932. Bally continued as one of the major pinball manufacturers through the twentieth century. Both Bally and Gottlieb's company made money, even though the country was in the midst of the Great Depression, and their success set off a slew of imitators. More than a hundred companies began manufacturing similar games in the early 1930s, and pinball became a fixture of not only taverns, but also drugstores, barbershops, and gas stations. By 1935, the game design had changed so that the playing field had its own table. The games were electrified, so that parts of the playing field could light up, and the game could keep score and pay out prize money automatically. Harry Williams, whose Williams Manufacturing Company became one of the foremost pinball manufacturers in the United States, added significant thrill to the game by electrifying the playing field with a "kicker" that could shoot the ball out of a hole and back onto the field. Williams's addition made the game much more fast-paced. Pinball in the 1930s was a more a game of chance than of skill. The movement of the balls was set by the plunger action at the beginning of the game, and players could only jostle the table to influence its course. The mathematics of the game had been studied by French philosopher Blaise Pascal and by Sir Francis Galton in England, who was a cousin of Charles Darwin and best known as the father of eugenics. These men had charted the probability of the ball reaching certain holes; skill at the game was close to that needed at roulette or dice. In the wild proliferation of Depression-era coin-operated games, some manufacturers made ones that emphasized the gambling aspect, such as mechanical dog races and horse races. This tarred the reputation of pinball. By the end of the 1930s, pinball shared other gambling games' bleak reputation, and many municipalities moved to ban it. Pinball was outlawed in Los Angeles and Chicago, centers of pinball manufacturing, and in New York, Mayor Fiorello LaGuardia made opposition to pinball a focal point of his mayoral election campaign. Pinball was outlawed in New York City in 1941, and a mayoral commission declared that pinball could lead youths to a life of crime. Pinball still flourished, however, in suburban locations, particularly in roadhouses beyond city bounds. The invention of flippers to push the ball on the playing field changed pinball decisively. Flippers were invented by an engineer for Gottlieb Manufacturing, and they were first put into the game Humpty Dumpty in 1947. By pushing buttons on the side of the game table, players could make the finger-like flippers bat the balls in play. Other manufacturers immediately copied Gottlieb, and flippers became standard on all pinball games ever since. Now the game definitely depended on the player's skill, and so pinball was able to disassociate itself from gambling games. A 1956 Federal court case made a definitive ruling that flipper-type pinball games were not gambling games and could not be regulated as such. However, municipalities still made distinctions between different types of pinball games. In some areas, machines that rewarded high-scoring players with a free game were illegal, and in other places, the automatic plungers that shoot the ball onto the playfield were the banned element. Such ordinances began to be repealed in the late 1960s, though it was not until January 1977 that pinball was finally legal again in Chicago. New York had legalized pinball the year before, and Los Angeles in 1972.
games were abandoned for simpler versions, and new games were not nearly as innovative as the games of the previous decade. Major manufacturers went bankrupt or ceased production. By the end of the 1990s, only one manufacturer was left, Williams Electronics Games, Inc., in Chicago, which made both Williams and Bally brand games. Williams ceased production of traditional pinball games in October 1999. Old pinball games and pinball backglass art are avidly collected by fans. While a new pinball game took only 20-30 hours to manufacture, the design process was far more protracted. Designing a new game took a team of professionals from 12-18 months, and the investment cost could run up to a million dollars. Games were designed by teams, with members taking on specialized tasks. The team included a game designer, who came up with the game concept and generally organized the other members; a software developer; an artist to come up with the backglass art and playing field graphics; a mechanical engineer, responsible for the design of all the gadgets on the playing field; a sound designer to create the music and other sound effects for the game; a mechanical designer, who brought together the drawings and designs from other team members; an animator to animate images on the scoring display; an electrical engineer and a cable designer to work out the circuitry and wiring; sculptors and model-makers to build the prototype devices for the playing field, and a publications writer to write the technical documents and manuals. The team might include other people, as well, such as someone who kept track of the cost of materials, and people working in marketing, sales, and licensing. The design work starts with a concept, which might be an original idea or might come from a licensed product, such as a movie. After the concept is agreed upon, the design team works on the layout of the playing field. Designers fiddle with placements of any special elements the game will have, and try to work out how the player will make shots leading to the element. The placement of ramps, flippers, kickers, tilt mechanisms, and such is planned out, while the mechanical engineer produces prototypes for the special elements. A. Playfield. B. Flipper mechanism. C. Pop bumper. playfield. The designers use computer assisted design (CAD) software to record their plans, and this software is then used to control a computer-driven routing machine that cuts the board. The game elements for the whitewood are made by hand and glued on. Lights, ramps, and flippers are added. The whitewood may go through many revisions, as placements are changed or elements taken off or added. When the design seems satisfactory, the whitewood is wired to make it playable. Meanwhile the software developer has been creating the unique software to control the game. Williams, the last major American pinball manufacturer, had developed its own proprietary pinball operating system so that a basic framework could be used for each game, simplifying the design process. The software developer also works with the lighting and sound designers and animators to run all these effects. At the whitewood stage, the designers can actually play the game they have created, and work on developing rules. Meanwhile the artist creates sketches for the backglass. If the game is based on a licensed theme, the artist needs to submit sketches for approval to the licensing agency. When the whitewood is near its final form, the artist makes sketches for the playfield. Pinball artists in the 1990s utilized traditional media such as pen and ink and paint, as well as computer graphics. While the game is in development, team members keep constant track of how much the game might cost to make. If parts need to be ordered from an outside vendor, the team needs to retrieve estimates from the suppliers. The game has a total budget, and sometimes the cost of one spectacular effect means that other game elements, such as lighting, have to be redesigned to make them cheaper. The design team also creates a bill of materials, listing every part needed to make the game. Parts are ordered so that everything is in place when the game is ready to be mass produced. After the design is finalized, workers at the plant assemble 10-20 prototypes. These are completely finished games, just like ones that will eventually be sold. The prototypes help the production plant determine that all the parts fit together, that the suppliers have sent the correct parts, and that mass production will go smoothly. Any glitches in the assembly are caught at this stage. And if any part of the manufacturing process needs to be modified, it is discovered now. The prototypes are also used for testing. The raw materials for pinball are not extraordinary. Inexpensive, sturdy plywood is used for the playfield, wiring boards, and cabinet. Metal parts, such as screws and springs, are made out of a variety of common materials, such as stainless steel and aluminum. Special elements on the playfield may be of molded plastic. Manufacturers require vendors to supply parts exactly to specifications, and to hold down production costs, which are considerable, the cheapest materials possible may be used. 1 Almost all the production of a pinball game is done by hand. The exception is the manufacture of the playfield. The design for the playfield is programmed into a special machine. Workers load plywood into the machine, and it squeezes each board under high pressure. The pressure incises each side of the board with marks, which show where all the assembly units go. 2 Pinball backglasses and playing field art are made by the silk-screen printing process, also called stencil printing. This is usually done by an outside vendor. From the artist's design, the printer makes a series of patterns called stencils that break down the design into four colors. That is, all the red parts of the design are isolated on one stencil, all the blue on another, and so on. Through combinations of four colors, every possible shade can be made. The stencils are made of a sieve-like fabric. Ink will pass through the open weave of the fabric and adhere to the material being printed. The printer lays the stencil, which might be a thin, plastic laminate, down on the material. An applicator sprays the color. Then the stencil is lifted, the material briefly dried, and the next stencil laid down. After the fourth color, the design is complete. For a backglass, the whole design could be screened as one piece. For the playfield, the artwork is broken up into small sections. At the pinball factory, workers punch out the sections and adhere them to the playfield. This way, the artwork is made to fit around the holes for the targets and other mechanical parts. 3 Most of the remaining work is done by hand. 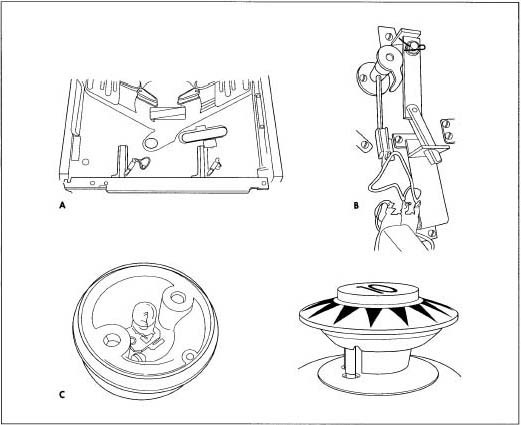 Some of the small parts, such as spring-loaded bumper mechanisms, may have to be put together at the factory from components parts. Then these parts are assembled on the board. The wiring is very complicated. Workers painstakingly connect the wires, using screw drivers and soldering guns. The cabinets are made as rectangular hollow boxes. Workers screw rails on to hold the circuit boards and playfield. The screened art for the backglass is inserted in the backglass assembly, and that part attached to the main cabinet. Each game has close to 1,000 parts. The whole game takes from 20-30 hours to finish, and the factory itself requires about 1,000 workers. Most of the quality control in pinball manufacturing is done before mass production begins. Individual parts from vendors are inspected and measured to make sure they are to specification. But the main check the manufacturer has on total product quality is in the prototypes made after the design process is complete. These 10-20 prototypes are tested in a variety of ways, including playability, general safety, and ability to withstand shipping. One is played on regularly, for field testing. One prototype is tested for sturdiness during shipping-this suffers a drop test. Another is sent to a private laboratory for a safety test, to make sure players could not be injured by the game. Other prototypes are used for publicity photographs, for the rules or manual writer, and perhaps for display at trade shows or promotions. Even after the prototypes pass inspection, the manufacturer might make a small run of some 50-100 games, just to make sure that everything is set in the production room for a bigger batch. Bueschel, Richard M. Illustrated Historical Guide to Pinball Machines. Vol. 1. Wheat Ridge, CO: Hoflin Publishing Ltd, 1988. Eiden, Heribert, and Jurgen Lukas. Pinball Machines. West Chester, PA: Schiffer Publishing Ltd., 1992. Sharpe, Roger C. Pinball! New York: E. P. Dutton, 1977.